Part of your responsibility as a home owner is managing risk when it comes to home security, and forewarned is forearmed as they say. 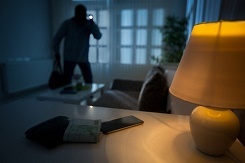 Choosing the appropriate security protection for your home is often a matter of weighing up the cost of security with the risk of being burgled. So how do you measure this? There are various ways; consulting your local Neighbourhood Watch group, attending local PACT (Police and Communities Together) meetings or monitoring crime information on your local police force website. If it’s just a quick ‘acid test’ indicator you’re looking for, then Money Supermarket offer an online tool that allows you to check the burglary rates for your postcode area. Simply go to the Burglary Hotspot site and enter your postcode and it will provide you with your percentage chance of being burgled and where your postcode ranks in the country in terms of burglary. We put our own postcode in and in WF1 we have a 0.94% chance of being burgled. Of the 2,216 UK postcode areas, we are the 1,358th most likely to be burgled. That’s quite reassuring. It also provides information for the surrounding area. For example, of the 14 nearby postcode areas, which mainly includes Wakefield and the 5 towns areas but also some Leeds and Barnsley postcodes, WF1 is the 12th most likely area to be burgled. LS15 being the area most likely to be burgled and WF5 being the least. You can enter your postcode here to see how your area fares. So, does this help? To a degree it does. If the results reveal that you are in an area with a high burglary rate then that really is your cue to make sure you are appropriately protected. But what if you’re in an area with a low rate? Can you sit back and think that means you’re immune from risk? We’re based in an area with a 0.94% risk of burglary so does that mean we don’t know anyone who has been burgled? Of course it doesn’t. We know more than most that no area is safe from burglary and theft because we deal with it on a daily basis (it’s amazing how many people wait until they’ve had an issue before adding security measures). Our advice would be to look at the stats so you have a reasonable picture of risk. If your risk is low then that’s great, and should give you some peace of mind, but don’t allow yourself to be lulled into a false sense of security (literally!). It’s still really important to make sure your home is protected because incidents still happen. Of course, the level of information that we all have access to now can even INCREASE risk; if all those living in LS15 become aware of their high risk and put good security protection in place, the burglars soon realise their job has become much harder and move on to another area where people are less security conscious – making risk a constantly evolving concept that you can’t be complacent about. The best advice is always to set your security at a higher rate than your perceived risk because you don’t want to be the one to prove the statistics wrong. It’s always better to be over protected than inadequately so, plus the cost is often less than you think (and definitely less than a burglary if you count the psychological cost). If you would like advice on home security, then please call us on 0800 612 9799 (free from a landline) or 0345 833 5543 (local rate from a mobile). previous Beware the Grey Crimewave!